Jeff Daniels for CNBC: An indoor vertical farm that uses 90 percent less water than conventional growers is about to launch in Las Vegas and will be able to supply nearly 9,500 servings of leafy green salads per day to casinos and local restaurant chains. "Las Vegas is the location that has the highest density of high-end restaurants, which can afford this premium specialty product," said Brock Leach, chief operating officer and general manager of Oasis Biotech. "We're going to be able to get our product from harvest to the customer in around 24 hours." 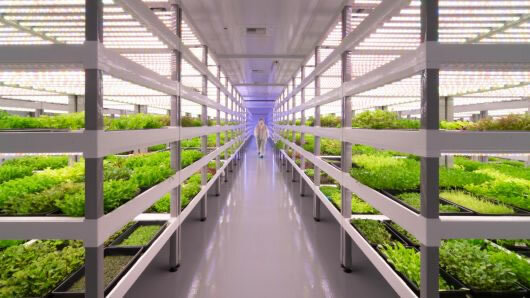 Oasis Biotech, a Chinese-backed farm that uses hydroponic watering and micro climate controls for crop cultivation, is scheduled to make its first delivery in Las Vegas on July 24. The 215,000-square-foot facility is expected to be one of the largest in the nation when fully built and will initially focus on growing baby greens, micro greens and specialty herbs but plans to eventually expand into baby carrots as well as soft fruits, including strawberries. The chemical-free facility uses hydroponics technology, so it grows plants without soil. It also uses high-end clean rooms similar to those found in computer manufacturing as well as special filters and ultraviolet lights to control air and water — all designed to keep the food safe.